Mining is inherently a long-term business and it is essential to put in place the right actions today which will benefit the future of a project, rather than focusing on short-term outcomes. This is an approach that Petra follows across all aspects of the business, from our operational planning to how we structure our environmental and social management, in alignment with the mine plan and potential mine life of each asset. We see sustainability management as a way to unlock long term value and significant business benefits through the responsible stewardship of the material issues that impact our operations. Sustainability objectives are embedded at all Petra operations and indicators are used to monitor and provide information about performance to the on-mine and Group management. We have established a robust system of reporting on these indicators on a daily basis at mine level, and on a monthly and quarterly basis reports are prepared by the mine management and the Group discipline managers for the HSSE Committee. Each operation’s individual mine Health, Safety and Environmental Committee (“HSE Committee”) meets on a monthly basis and the Group HSE Operational Steering Committee (the “Steering Committee”) meets quarterly. The Steering Committee works closely with the Group HSSE Committee to actively monitor Group HSSE performance throughout the year. The HSSE Committee is responsible for overseeing the quarterly reports, a summary of which is submitted to the Board, as well as additional ad hoc reports on topics as required. HSSE is a standing item at every board meeting, ensuring that adequate time is spent discussing HSSE matters and Group performance. The Group’s approach to sustainability is reinforced through its Group and mine level policies and strategies, which cover the key sustainability areas. The aim of our HSSE Management Framework is to ensure that Petra as a company can meet its sustainability objectives, comply with all relevant legislation, strive to meet best practice standards as appropriate for a company of Petra’s size, and monitor and improve its sustainability performance. Our mission is to develop our assets in a responsible manner, thereby unlocking value for all stakeholders. Effective, regular and transparent communication with all our stakeholders is considered a core priority and essential to the current and future success of the Group. Stakeholder engagement therefore takes place on a continuous basis at both Group and operating company level. The mining industry in South Africa is highly regulated in terms of its social and environmental performance, with companies having to uphold stringent standards, which in some cases go beyond the requirements of many international best practice guidelines, in order to maintain their licence to operate. Petra’s approach at all its operations is to go ‘beyond compliance’ in terms of meeting its health and safety, social, environmental and local community obligations, by adopting a holistic approach with the true long-term sustainability of each operation in mind and to do everything possible to positively enhance its direct sphere of influence. Read more about the regulatory environment in South Africa and Tanzania. Petra’s FY 2018 Sustainability Report was prepared according to the GRI Standards, which are the benchmark for sustainability reporting globally. 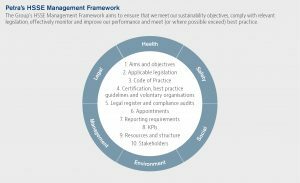 Our sustainability policies and reporting processes are aligned with international standards, including the UN Global Compact, the UN Universal Declaration of Human Rights, the Kimberley Process, the Extractive Industries Transparency Initiative, ISO 14001, OHSAS 18001 and the ILO Declaration on Fundamental Principles and Rights at Work. Petra also provides disclosure to the Carbon Disclosure Project (CDP), FTSE4Good, MSCI and Sustainalytics. Petra is a constituent of the FTSE4Good UK Index. FTSE Russell (the trading name of FTSE International Limited and Frank Russell Company) confirms that Petra Diamonds has been independently assessed according to the FTSE4Good criteria, and has satisfied the requirements to become a constituent of the FTSE4Good Index Series. 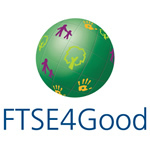 Created by the global index provider FTSE Russell, FTSE4Good is an equity index series that is designed to facilitate investment in companies that meet globally recognised corporate responsibility standards. Companies in the FTSE4Good Index Series have met stringent environmental, social and governance criteria, and are positioned to capitalise on the benefits of responsible business practice.